Designed in USA by Nick Adams, the APEX by Timesvape is 25mm in diameter and 3.8mm in juice well depth. It comes with Hex posts build deck for easy single or dual coils building and widely used gold-plated BF pin. 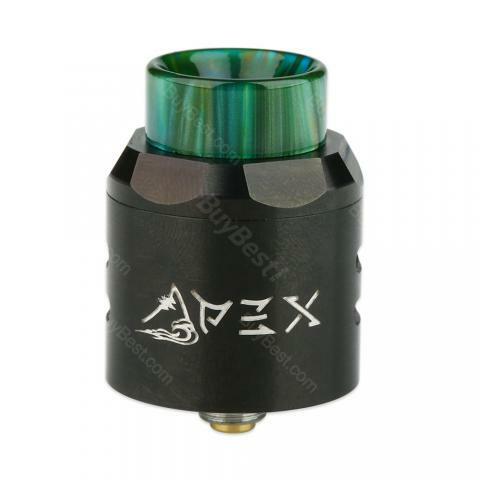 Here comes the Timesvape APEX RDA! It is 25mm in diameter with dual-post deck for buiding! As the first project designed by Nick Adams (IG@nickchrome80) in USA, The Timesvape APEX is very unique in appearance. It adopts an innovative hex posts build deck with M5 Kimi screw and 3.8mm juice well for easy single or dual coils building. The Timesvape APEX also comes with a gold-plated BF (bottom feeder) pin, perfectly for Squonk MOD. Along with its adjustable twin cyclops dual airflow system, three 810 drip tips and optional copper 510 pin, Timesvape APEX will lift up your vaping experience to a new level. Good choice for cloud chasers. • With gold-plated Squonk BF pin, APEX RDA is compatible with most Squonk MODs such as IJOY CAPO Squonker MOD and GeekVape Athena Mechanical Squonk MOD . • You also can get the DIY Wire, Wick & Tool in BuyBest. Timesvape APEX RDA Tank Atomizer, tank is good, the taste and vapor level are great!